This package has the core interfaces of network and table data structures that are foundational to Cytoscape. An interface for objects that require an explicit clean up at the end of their lifecycle. CyIdentifiable is an interface that indicates that the implementing object can be considered a key into a table. CyNetwork is the primary interface for representing a network (graph) data structure in Cytoscape. A singleton factory object used for instantiating CyNetwork objects. Provides access to all network-table relationships. A simple representation of a table object consisting of rows and columns. An interface describing a factory used for creating CyTable objects. A snapshot of information about a relationship shared between a CyTable instance and an associated CyNetworks. Information object for columns that stores extra Virtual Column information if applicable. This package has the core interfaces of network and table data structures that are foundational to Cytoscape. Cytoscape supports two basic, separate types of data: network data (CyNetwork) and table data (CyTable). For the most part, the table and network data structures are independent. However, Cytoscape can link them together by matching table rows with network object identifiers. (Network object is a phrase that means nodes, edges, or networks.) In fact, Cytoscape stores its own internal network object metadata in tables using this linkage. CyTable is Cytoscape's data structure for tabular data. 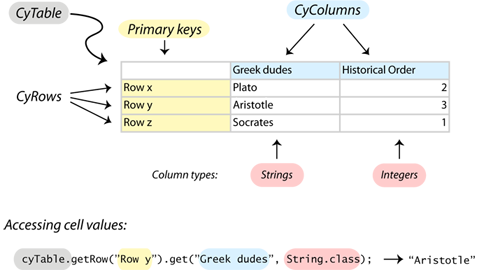 A CyTable consists of columns (CyColumn) and rows (CyRow). Columns have unique names and are typed. A column has a single type that is only defined when it is created. A column's type cannot be changed after it has been created. A column would have the string type if it stores text. Or it could have the integer type if it stores whole numbers. Besides strings and integers, columns can have other types, like booleans, floating point numbers, and lists. You can get cell values in a table through a CyRow. Each row has a primary key, which is the row's unique identifier. No two rows in the same table have the same primary key. In each table, there is one column designated for storing the primary keys of each row. The column for the primary key and its type are specified when the table is created (see CyTableFactory). You can share the contents of a column in one table with another table. These are called virtual columns. If cell values change in one virtual column, all other tables with that virtual column will change too. Virtual columns are used to share data between networks. Target table: the table into which you want to put the virtual column. Target column: the name of the virtual column you want in the target table. 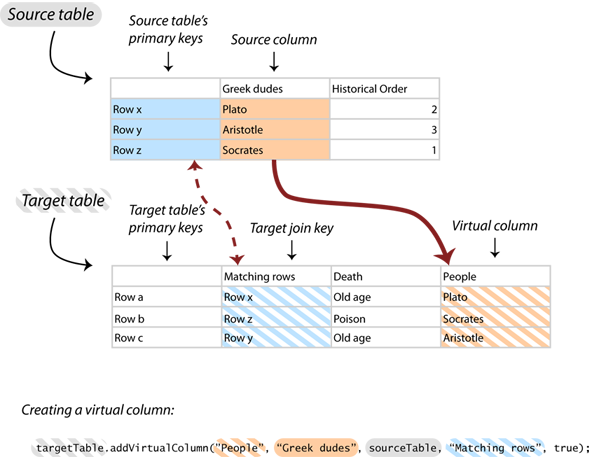 Source table: the table from which you want to get your virtual column's contents. Source column: the column in the source table from which you want to get your virtual column's contents. Target join key: the column in the target table whose cells match the source table's primary key column. This is used to match up the rows between the source and target tables. Each CyTable has a unique identifier (SUID). Network objects (CyNetworks, CyNodes, and CyEdges) also have SUIDs that uniquely identify them. They all inherit from the same interface, CyIdentifiable. SUIDs are similar to primary keys. SUIDs refer to network objects and CyTables, whereas primary keys refer only to CyRows. You cannot specify SUIDs, and they always have the type long. In contrast to SUIDs, you can control the values of primary keys and its type. SUIDs do not change in the same session. When the user saves the session and opens it up again later, SUIDs will stay the same. If the user imports the same network in two different sessions (or imports the same network twice), the SUIDs of network objects are not guaranteed to be the same for the same network objects. Typically, you do not need to create CyTables yourself. Instead, use tables created for each network object. However, you may need to create separate CyTables for storing tabular data not directly related to network objects. To create a CyTable, use CyTableFactory. If your app is a simple app: You have a class that inherits from AbstractCySwingApp or AbstractCyApp. You use one of these classes to get CyTableFactory with the CyAppAdapter.getCyTableFactory() method. where bc is the OSGi BundleContext. A network (CyNetwork) is a collection of nodes (CyNode) and edges (CyEdge) that connect nodes together. An edge is defined as a link between two nodes. This implies that nodes must exist in the network for the edge to exist. CyNetworks support multigraphs, which means that two nodes can be connected together by more than one edge. CyNetworks do not support hypergraphs, so edges cannot connect more than two nodes. A metanode is a node that has its own nested network inside of it. 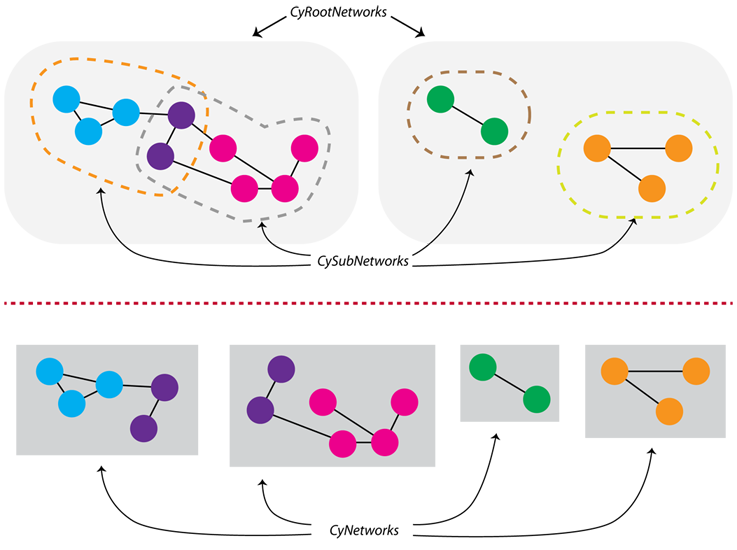 Metanodes establish a hierarchy of networks, where, in a higher level network, a node contains a nested network. That contained network could, in turn, have other metanodes that contain their own nested networks. CyNodes have network pointers (see CyNode.getNetworkPointer()), which point to the node's nested network. However, if you want to use nested networks, use the Groups API (org.cytoscape.group). Cytoscape has multiple root networks (CyRootNetwork). Each root network has multiple subnetworks (CySubNetwork). When you are using a CyNetwork, you're really using a CySubNetwork. Accessing root networks and subnetworks is hidden, because you usually do not need to know about the root network. Root networks and subnetworks are defined in this subpackage: org.cytoscape.model.subnetwork. All nodes and edges exist in the root network. The subnetwork merely refers to a subset of nodes and edges in the root network. Nodes and edges are shared amongst all of the subnetworks of the same root network. The purpose of this structure is so that you can share table data across networks. You can set up shared tables so that data values in one subnetwork (say for a node) are shared with the same node in another subnetwork. This is useful for importing a lot of data (e.g. large expression data sets). You can also "save" nodes and edges for later use by keeping them in the root network and removing them from the subnetwork. This is used extensively in the CyGroup implementation, which builds a hierarchical structure onto Cytoscape's model. When the first network is created by the CyNetworkFactory, a new CyRootNetwork is first created. Each root network has a base network, which is a CySubNetwork that contains everything in the root network. The base network is is returned by CyNetworkFactory.createNetwork(). CyRootNetwork also provides methods to create and add new subnetworks (see CyRootNetwork.addSubNetwork()). Shared: data in this table is shared across all networks with the same CyRootNetwork and is visible to the user. Local: data in this table is specific only to the network and is visible to the user. Hidden: data in this table is local to the network and is invisible to the user. 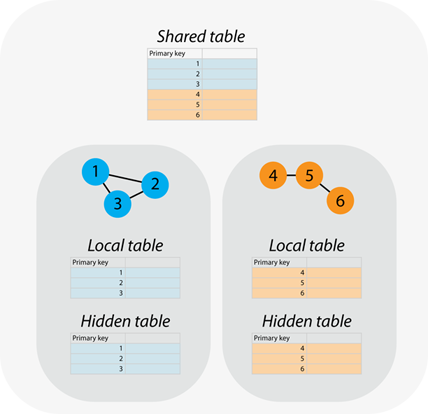 Most of the time, it is not important whether data is coming from local or shared tables. To make it easier to retrieve data, we establish default tables, which combine local tables and the shared tables together in one table. Default tables do not include hidden tables. When a new column is created in the default table, it is actually created in the shared table. This makes the column available to all networks in the same root. Use the private local table to create a column local to only one network. There are two ways of getting node and edge data from one of the tables listed above. Here, you pass in the SUID when using CyTable.getRow(java.lang.Object) method, not the edge itself. Instead of passing in the SUID, you just pass in the edge itself. When you first create a network or table, it is not shown to the user. In fact, Cytoscape is not even aware that you have just created a table or network. You must first register your new table or network with CyTableManager or CyNetworkManager, respectively, if you want Cytoscape to be aware of the network or table and for it to be shown to the user. You do not have to register networks or tables. The benefit of unregistered networks and tables is that you can use CyNetwork and CyTable as flexible data structures. You can use them in your own internal algorithms and storage for intermediary data, where you do not want the user to see them. The CyNetworkManager is the repository for the information about registered networks. It provides mechanisms to add (CyNetworkManager.addNetwork(org.cytoscape.model.CyNetwork)) remove (CyNetworkManager.destroyNetwork(org.cytoscape.model.CyNetwork)) and inquire about networks (CyNetworkManager.getNetwork(long), CyNetworkManager.getNetworkSet(), and CyNetworkManager.networkExists(long)). Similarly, the CyTableManager is the repository for the information about registered tables. Apps can receive notifications that something has changed within the model. For example, an App that provides the user with a list of available column names would want to update that list when a new network was added. Two very common examples are to be notified when a network has been added, and to be notified when the the user has selected something. If the App is an OSGi bundle, register the listener in the CyActivator class. // Probably want a CyNetwork or list of CyNetworks as arguments here?